John Servis hasn't had a Breeders' Cup starter since sending Jostle out to a ninth-place finish in the 2000 Distaff, though he's enjoyed considerable success at Churchill Downs, host track of the 2018 world championships. Servis won the 2004 Kentucky Derby with Smarty Jones and the 2016 Kentucky Oaks with Cathryn Sophia. Servis made good with his second Breeders' Cup starter on Friday when Jaywalk – a filly from the first crop by Spendthrift Farm stallion Cross Traffic racing for Chuck Zacney's Cash Is King and Leonard Green's D.J. Stable – scored a dominating 5 1/2-length victory under jockey Joel Rosario in the $2-million, Grade 1 Juvenile Fillies. Jaywalk paid $13 for the mild upset after covering 1 1/16 miles on a fast track in 1:43.62. Restless Rider finished second in the field of 10 2-year-old fillies, a half length in front of Vibrance in third, with favorite Bellafina 3 1/4 lengths farther back and Cassies Dreamer finishing fifth. “She got out of there and just wanted to go,” Rosario said after the front-running win. The Dominican Republic native was riding Jaywalk for the second time, having been aboard for her wire to wire victory last out in the G1 Frizette at Belmont Park on Oct. 7. The Juvenile was her first time around two turns. 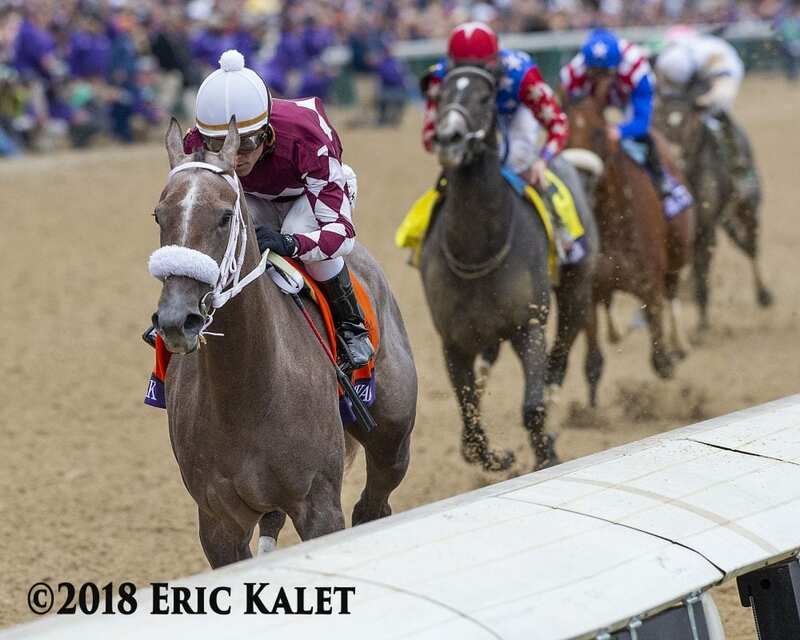 Jaywalk broke smoothly from the number seven post position and went to the front soon after the start, outrunning Serengeti Empress to her inside for the lead. Rosario nursed Jaywalk through fractions of :23.26 and :46.76 for the opening half. Bellafina, the two-time G1 winner who shipped to Kentucky from California for trainer Simon Callaghan and owner Kaleem Shah, was floated wide around the first turn after breaking from the outside post position, then chased Jaywalk throughout. Approaching the far turn, Jaywalk maintained the advantage, the six furlongs in 1:11.48, as Vibrance made a move up the rail to try and make a race of it. Bellafina made her bid to Jaywalk's outside and Restless Rider ranged up outside those three at the top of the stretch. Rosario and Jaywalk maintained command, however, and were never seriously threatened. Restless Rider and Brian Hernandez finished well to be second, giving trainer Ken McPeek his sixth second-place finish in a Breeders' Cup race while extending his winless streak to 30 races. “Her cruising speed is wicked and she just runs them off their feet,” said Servis of Jaywalk. Jaywalk debuted at Monmouth Park on June 23, finishing second to Chocolate Kisses going five furlongs, then broke her maiden next out on July 24 at Parx Racing, drawing off to win by 7 1/2 lengths on a sloppy track. Servis sent the filly to Delaware Park where she won the White Clay Creek Stakes on Aug. 22, coming from off the pace under jockey Joshua Navarro. She won the Frizette next out at 6-1 odds under Rosario. Jaywalk's record now stands at four wins from five starts and under normal circumstances she would be the heavy favorite to win the Eclipse Award as outstanding 2-year-old filly. But when Jaywalk won the Juvenile Fillies, Churchill Downs was still buzzing about the performance of undefeated Newspaperofrecord, who was spectacular in her 6 3/4-length triumph in the G1 Juvenile Fillies Turf 30 minutes earlier. Bred in Kentucky by Gainesway Thoroughbreds, Jaywalk was produced from the Orientate mare Lady Pewitt. She was purchased for $190,000 from Gainesway, agent, at the Keeneland September Yearling Sale. The win put Cross Traffic, a son of Unbridled's Song, atop the freshman sire list. Unraced at 2 and 3, Cross Traffic won three of six starts during his 4-year-old campaign, topped by a victory in the Whitney. He stood for $7,500 in 2018 and his fee for 2019 will be $15,000. Which Breeders' Cup Future Stars Friday performance was most impressive? This entry was posted in Breeders' Cup, NL List and tagged 2018 breeders' cup, bellafina, breeders' cup juvenile fillies, cash is king, cross traffic, d j stable, jaywalk, joel rosario, john servis by Paulick Report Staff. Bookmark the permalink.